^ "The L.A. in my Game," with Baron Davis: Part I. ESPN. November 11, 2011 [June 30, 2012]. 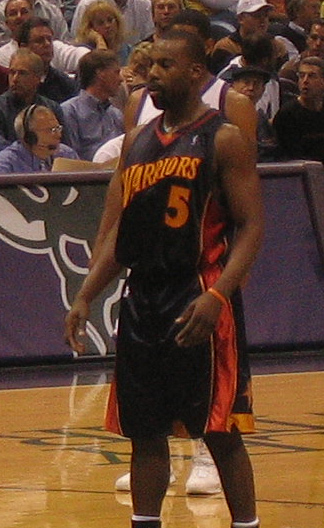 ^ Baron Davis, UCLA. Ibiblio.org. [May 20, 2012]. ^ ESPN – Baron Davis going back to home state as Warrior – NBA. ESPN. February 24, 2005 [May 20, 2012]. ^ Kerr, Steve. Greatest playoff show on earth?. NBA Experts Blog. Yahoo! Sports. May 12, 2007. 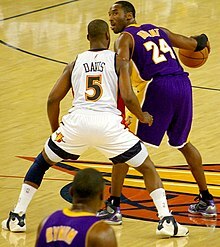 ^ NBA Basketball 2007 Playoffs. CBSSports.com. （原始内容存档于2007-10-09）. 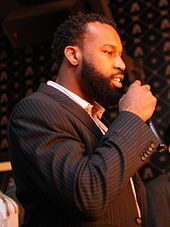 ^ Baron Davis Info Page. NBA. （原始内容存档于2007-10-24）. ^ Don Nelson makes huge mistake by sitting Baron Davis – Golden State Warriors News. Basketballpass.com. [May 20, 2012]. ^ By BOB BAUM, AP Sports Writer Tuesday, Apr 15, 2008. Stoudemire, Nash lead Suns as they eliminate Warriors. Sports.yahoo.com. April 15, 2008 [May 20, 2012]. ^ WHAT GIVES, GUYS? Nelson says there's no problem, Davis says very little. San Francisco Chronicle. April 16, 2008 [May 20, 2012]. ^ RealGM: Wiretap Archives: Agent Says Baron May Opt Out. Basketball.realgm.com. May 16, 2012 [May 20, 2012]. ^ Brock Keeling. Baron Davis Opts Out of Warriors Contract. Sfist.com. June 30, 2008 [May 20, 2012]. （原始内容存档于2012年4月6日）. ^ Marc Stein. ESPN – Davis verbally agrees to go to Clippers, leave Warriors – NBA. ESPN. July 7, 2008 [May 20, 2012]. ^ Davis signs with Clippers. ESPN. July 10, 2008. ^ Davis hurt again as Clippers blow big lead 互联网档案馆的存檔，存档日期2011-06-28. ^ 2008–09 Los Angeles Clippers Roster and Statistics. Basketball-Reference.com. [May 20, 2012]. ^ Draft Picks, Including Clippers' Pick In Baron Davis Trade, Could Help Cavaliers Rebuild Quickly. SBNation.com. February 24, 2011 [May 20, 2012]. ^ Cavaliers Acquire 2011 First round Pick and Two-Time All-Star Baron Davis From Clippers. NBA. February 24, 2011 [February 24, 2011]. ^ FINAL. NBA. [May 20, 2012]. ^ 23連敗平紀錄 騎士魂斷客場. 蘋果日報. 2011年2月6日. ^ Baron Davis Game By Game Stats and Performance – New York Knicks. ESPN. [May 20, 2012]. ^ Miami Heat vs. Cleveland Cavaliers – Box Score – March 29, 2011. ESPN. March 29, 2011 [May 20, 2012]. ^ Stein, Marc. Cavaliers amnesty Baron Davis. ESPN. [December 15, 2011]. ^ Most Popular E-mail Newsletter. USA Today. December 14, 2011. ^ Baron Davis: I Chose New York Knicks Over Los Angeles Lakers, Miami Heat « CBS New York. Newyork.cbslocal.com. December 20, 2011 [May 20, 2012]. ^ Begley, Ian. Knicks officially sign Baron Davis. ESPNNewYork.com. December 19, 2011. ^ Zwerling, Jared. Baron Davis' debut signals key for bench – Knicks Blog – ESPN New York. ESPN. May 16, 2012 [May 20, 2012]. ^ Begley, Ian. Baron Davis dislocates right kneecap. ESPN. May 6, 2012 [May 6, 2012]. ^ Begley, Ian. Baron Davis out for about a year. ESPN. May 7, 2012 [May 7, 2012]. ^ Baron Davis' Setting the Screen. NBA. [May 20, 2012]. ^ Davis, Baron. Commentary for the movie "Step Brothers." (DVD). Columbia Pictures. 2008. ^ Alipour, Sam. Baron Davis is starstruck on 'Hot in Cleveland'. ESPN. January 2, 2011 [May 20, 2012]. ^ Baron Davis Marries Isabella Brewster!. Yahoo! TV. [February 6, 2014]. ^ Carmax Pregame report: Clippers vs. Bucks. Los Angeles Clippers. January 17, 2009. （原始内容存档于2016年1月10日）.